Board books let youngest readers share in the holiday spirit. 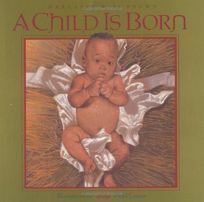 In a starred review of the picture book published in 200o, PW called A Child Is Born by Margaret Wise Brown, illus. by Floyd Cooper, (available in board book here for the first time) ""a posthumous holiday gift"" from the author of Goodnight Moon. Floyd's ""artistic interpretation-a multiethnic cast, including a black Holy Family-is one of a harmonious world community, sure to be appreciated by all.""